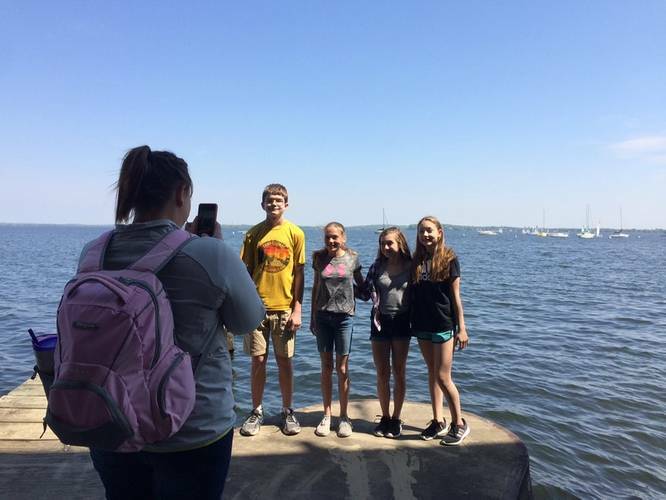 On a sun-drenched, nearly cloudless day with sight lines from the eastern horizon to the western, it’s a bit of an irony that a group of middle-school educators and students were on Lake Mendota in Madison to plumb what they couldn’t see. 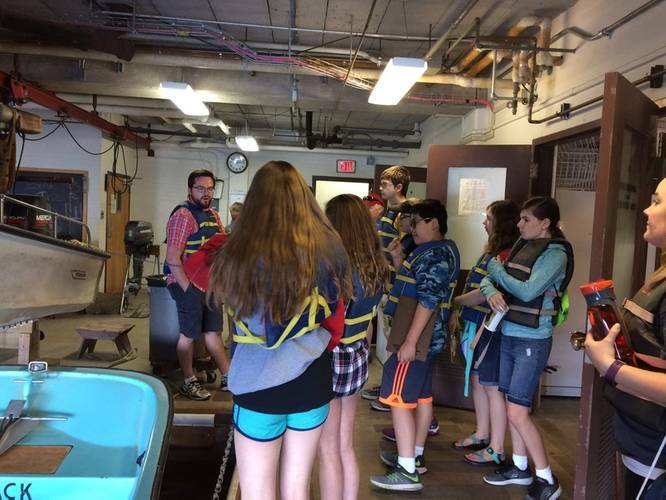 They were engaged in water-quality analyses. 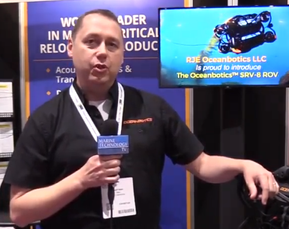 The occasion also represented the maiden voyage of the Trident, a remotely operated underwater vehicle (ROV) Sea Grant obtained through an organization known as OpenROV for use as a teaching tool. Prairie River Middle School Teacher Lynn Kurth brought four students from her hometown of Merrill, and Sue Nelson accompanied four charges from her middle school in Rochester, Minn.
Sam Johns, one of the Merrill students, wrote this in the application essay to earn a spot on the trip: “I love science and exploring new things, and I love history so I want to learn more about what’s on the bottom of Lake Mendota.” The Wisconsin students’ application essays, and other documentation of the experience, can be found at an online expedition diary. Johns’ comments pretty well sum up this demonstration of cross-border camaraderie, which had its origins aboard the replica three-masted wooden schooner out of Milwaukee, the Denis Sullivan. Last summer, Kurth and Nelson met as part of an educator workshop sponsored by the Minnesota and Wisconsin Sea Grant programs and with financial support from the Center for Great Lakes Literacy. Kurth was not only a dab hand on the boat, having participated in previous sails, but also an enthusiastic mentor for Nelson as they both strive to bring the Great Lakes alive in their classrooms. When asked what she was looking forward to as the day got underway, Kurth responded, “Getting the kids out here is the best part. A lot of the kids don’t have this kind of an opportunity.” She noted the day promotes Common Core learning. Along with hands-on science, students are enriching their grammar and writing skills because they are documenting the experience. She said the pair would be having their respective students share the data gathered on Lake Mendota. Further, they will collaborate on using a Hydrolab in the future. It is a large, tubular piece of water-testing equipment, vital to water resources professionals across the country. The day on the Madison lake, Kurth said, “Also keeps the kids connected.” Of her four students, two are moving on to high school next year but the soon-to-be eighth-graders will be science/English peer leaders in the classroom next year. And, the students from different states began their connectivity as part of this trip. They were interspersed between two boats to facilitate the budding water-quality collaborative relationships. Lakes offer abundant opportunities for learning—chemistry, biology and social science are just some of the themes. On that last one, social science, Tori Kiefer plays a role and was present for the day’s activities, demonstrating the tools of her trade as a maritime archeologist with the Wisconsin Historical Society. 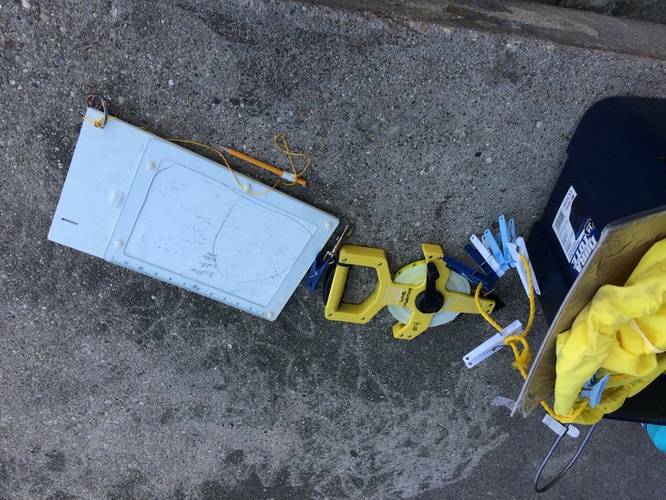 She packed along bright yellow bags complete with Mylar clipboards used to sketch wrecks and measuring tapes that define watery archaeological sites. Kiefer wasn’t scuba diving for the day, so the group would explore via the ROV. Kiefer had also participated in the 2017 Lake Michigan Denis Sullivan excursion and was happy to reunite with Kurth and Nelson for the day’s quest for underwater treasures. “I learned a lot from the teachers on that cruise and I want to continue that learning,” Kiefer said. She said she was looking forward to seeing how the educators would apply with their students the water-quality tests they practiced last summer. 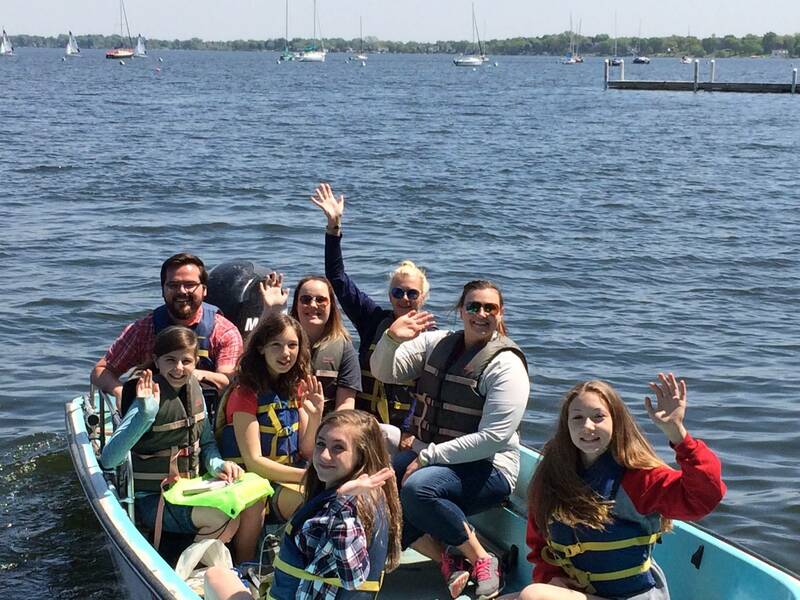 Although educators may not be able to replicate this sunny May day on Lake Mendota, an ROV and curriculum are available for teachers to check out of the Wisconsin Water Library for use in a small swimming pool to be set up in a classroom. The kit promotes learning about engineering, maritime history and underwater exploration. Kurth was instrumental in creating the teaching kit since she views its instruction on engineering as an ideal complement to the Hydrolab.